The Southern C Summit 2019—My Experience and Take-Aways! Hey, dears! I’m back from Sea Island, where I spent 3 days last week attending The Southern C Summit and celebrating my birthday! I’ve been wanting to attend The Southern C Summit for years. But living in Boston made it feel a bit too far to go (and the imposter syndrome voice in my head said no one would care about me or my biz since I was no longer living in the south). Now that Mark and I live in St. Pete, FL, though...it was just a short hop, skip, and a jump to Sea Island! When I saw this year’s summit fell over my birthday, I just had to sign up! And I am so entirely glad that I did. If you haven’t crossed paths with TSC before, they provide some of the best content for small business owners on the internet. From celebrating their attendees to real, actionable advice on all the different hats we wear, this team covers it all. I was really curious to see what the content presented at the summit itself would be like, when they provide such great advice on their site, already. To be honest, I was skeptical it would be as mind-blowing as everyone seemed to say it is. I have never been so happy to be wrong. I walked away from this year’s The Southern C Summit with pages and pages and pages of notes. I have a list of real, actionable advice and ideas to implement both now and down the road. 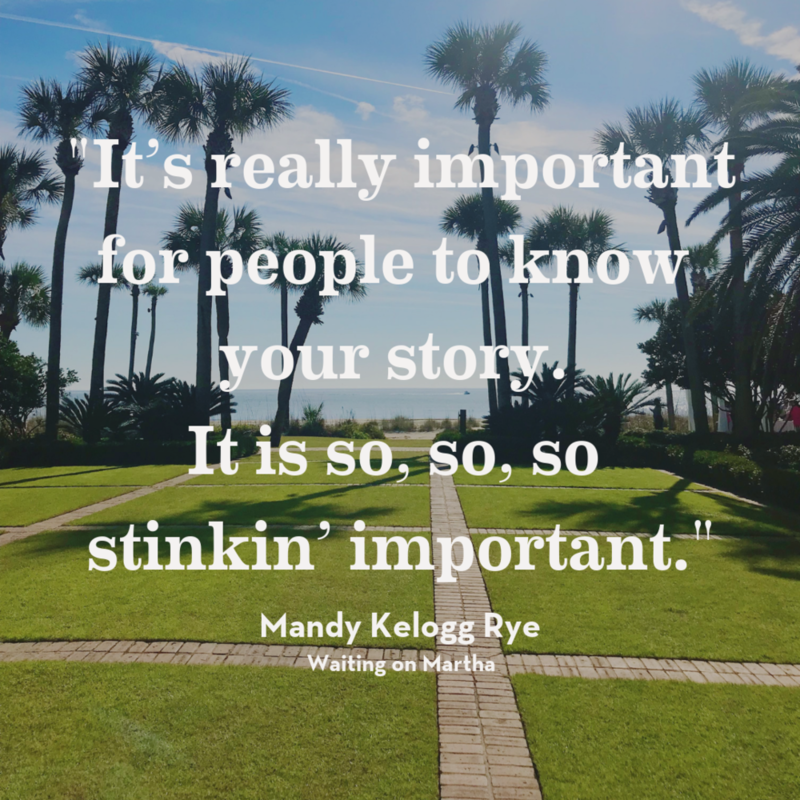 My TSC experience began with a workshop led by Mandy Kellog Rye of Waiting on Martha. I’ll be frank again, here: I didn’t know who she was before I walked into the room (sorry, Mandy!) -- probably because most of my social scrolling and internet shopping revolves around books. Two sentences out of her mouth, though, and I was hooked. She didn’t give platitudes or fluff advice about “just being yourself” online. Nope, she dove right in with statistics and real-life examples of things she’s tried, tossed, and totally loved for her business. She showed us the back end of tools she uses for her blog and shops (favorites being Klayvio and Unfold!). She shared how she chooses what content to post. She even made sure we were all protecting our Instagram accounts by enabling two-factor authentication (if you aren’t yet, instructions to do so are here!). The biggest internal “YAS, GIRL, PREACH” moment I had during Mandy’s workshop was when she said, “It’s really important for people to know your story. It is so, so, so stinkin’ important.” She even added a high-heeled mule foot-stamp for emphasis, sending her blonde waves swinging. She’s right! The one thing paying customers crave most is to know who (or what) they’re supporting with their hard-earned dollars. Let them in! Show your face, snap pics at the next office happy hour, or record a “hi there!” video. Several presenters touched on this topic during last week’s The Southern C Summit. 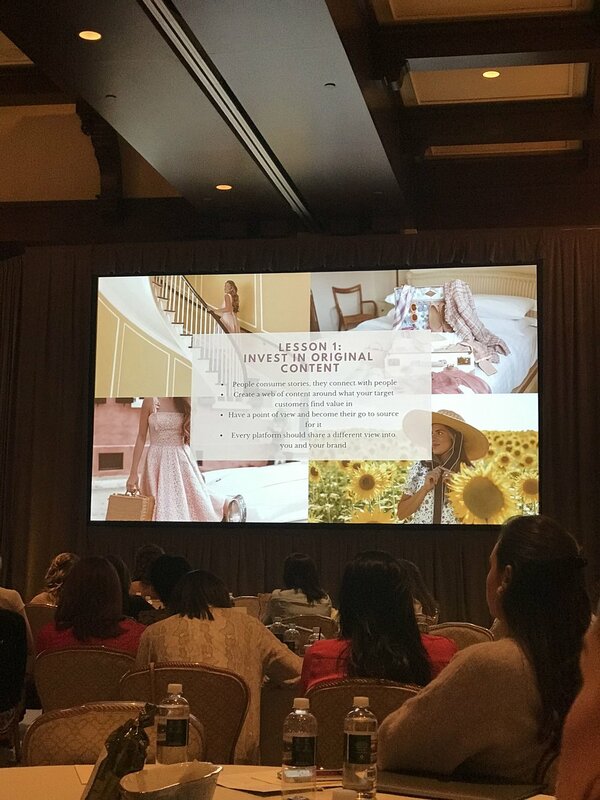 I loved how Elizabeth Mayhew and Lydia Mansel of Draper James laid out the the 3 C’s to a successful business: community, content, and commerce. They also talked about making your business a destination people want to come back to time and time again. For Draper James, that’s reflected in several ways, including the sitting areas in their Nashville store (inviting you to come in and chat awhile). Julia Engel and Thomas Berolzheimer of Gal Meets Glam and The Gal Meets Glam Collection also talked about becoming a content destination. They talked about really honing in on our own niche. No, you aren’t going to please everyone. But you don’t want to! You want to please your ideal customers. You want to appeal to the specific style, voice, and viewpoint that you share with your customers. You should know who your customers are and who they aren’t. Then, take the time to really plan out the content (visual and written) that will speak to them. Julia Engel and Thomas Berolzheimer brought up a rule of thumb I thought was great. 10% of what your customers spend on you, you should be spending on their experience. For example, if you splurge on a $500/night hotel room -- that hotel should be spending $50 to make your stay feel special (maybe that’s a bottle of champagne in the room when you arrive?). How can you use that rule of thumb to enhance your customer’s experience? Stacy Smallwood of Hampden Clothing also mentioned enhancing your client’s experience from start to finish. Just take a look at her living out this idea on Hampden’s Instagram account this week: she’s been sharing insider looks at New York Fashion Week! The extension of that question is, “...and how are you showing people you are the best?” You know what my answer is, right? THIS. Right here. It’s providing content that showcases your knowledge and your heart. I know that Asterism and Co. is the best content marketing agency in the book publishing world because we provide personal attention (I travel to each of my clients’ offices to plan strategy with them in person), diverse experience (I balance my publishing and content marketing experience with the varied expertise of our writers), and an always-learning attitude (hence: my attending last week’s TSC Summit!). Some of the biggest take-aways I had from The Southern C Summit weren’t from the fabulous presenters, they were from the incredibly talented, smart, kind, connected people sitting in the attendee seats right next to me. We grow with our community. So don’t be afraid to say hello! Darcy Miller, this year’s closeout speaker of the Summit, encouraged us to go for the ask. “The worst someone can say is ‘no.’” And it’s true! So say hello! Build those relationships genuinely and you’ll be amazed by how we can help each other. I am so glad I finally jumped in and attended The Southern C Summit this year. I will absolutely be back in 2020. Will I see you there? Shoot me a message on Instagram and tell me! Join my 2019 Reading Challenge — I’m on a mission not to read more but to read differently, and discover great writers!